Spring collections are already finding their way in stores and it feels good to see spring-theme collections, doesn't it? Today I have a review of some items from the lovely Dior Spring collection called Glowing Gardens. This spring, Peter Philips, Creative and Image Director for Dior Makeup, reinterprets the art of a gorgeous glow with a luminous makeup collection that teams new Backstage Pros essentials with eyeshadows and lipsticks in colours inspired by the flower gardens of Granville where Dior spent his childhood. Glowing Gardens collection includes 4 nail polishes and I have Lilac to show you. Oh I have to get my hands on Garden!! and maybe also Bleuette! 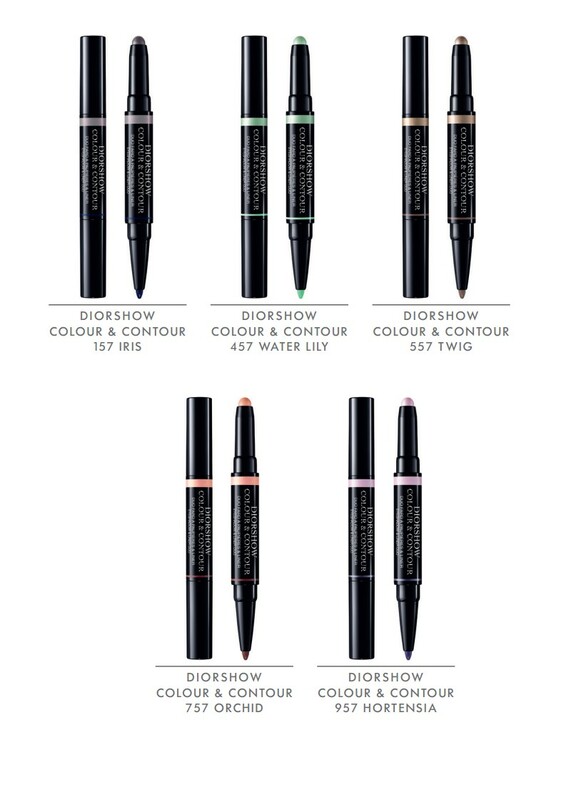 This spring Dior has released 5 limited edition Diorshow Colour and Contour Eyeliner and liner duos. These are double ended pencils with a creamy, long lasting, metallic shadow on one end and a complimentary satin liner on the other. I have Iris to show you in more details. The shadow-side of the pencil has just the right creaminess to be easy to blend but to stay in place nicely. You can either directly apply it on the lid without blending it if you want a very defined look or you can blend it to create a fresher look. Honestly when I first tried it on my hand, I was really suprised because it looked so good. I'm super impressed with the shadow, how it performs, the texture and the beautiful color and shimmer. I think it has the perfect amount of color and sparkles to make a super sophisticated shadow. If you have only 1 item to pick from this whole spring collection, I would definitely recommend one of these pencils! The other side of the duo is a pigemnted liner that doesn't smudge at all. Iris is a purply silver with pink shimmer and the liner is a deep blue that is still bright at the same time. That blue is totally awesome. It's more fun than a simple navy liner, it's richer and more vibrant but still very wearable. These Eyeshadow and Liner duos are limited edition and considering how amazing they are, I highly suggest that you have a look at them asap! I will probably get myself another one, either Orchid, Hortensia or Twig. I'll decide when I see them in store. That said, I'm super happy with Iris!! Lip Glow Liner - The first Dior lip liner that instantly delivers a long-wearing custom filler effect and rosy tint for expert makeup results. 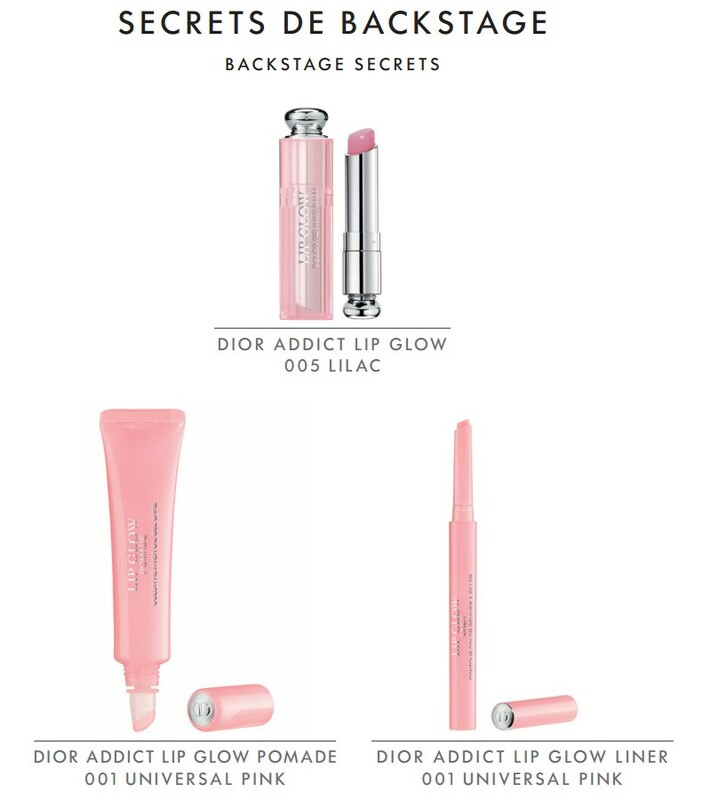 The universal shade of Dior Addict Lip Glow Linee suits all colours of lipstick and gloss for a clean, precise lip contour and lasting hold. It has a soft, rectractable tip that allows for precise application. Be careful not to extend the tip more than 1-2 mm otherwise it can easily break. I tried to pair it with a lip tint that I have that tends to feather (Holika Holika Bloody Oil tint shown here) to see if the Lip Glow Liner could prevent the feathering and it did! Dior also suggests to fill in the lips with the flat side of the tip as a fixing base for lipstick. For me this doesn't work very well because it doesn't spread well on larger areas (and I broke the tip trying this). It works well as a liner liner but I wouldn't recommend it as a lip primer. This liner would be better for people who have feathering issues when they use lipsticks. Lip Glow Pomade is a very emollient lip balm that contains oils and shea butter to hydrate the lips. It has an oil-gel texture with a high concentration of shea butter to provide the lips with deep nourrishment, protection, and instant comfort. Once on the lips, it looks shiny and rosy and makes the lips smooth and plump. Absolutely loving this Lip Pomade! It is perfect for on-the-go and has already saved my lips many times, especially now that the weather is cold and dry. It's another product that I love and would recommend.